The Occupational Safety and Health Administration (OSHA) is responsible for developing and enforcing workplace standards to ensure the health and safety of American workers. Employers across the country are required to comply with applicable OSHA standards for their place of work, which may be inspected by an OSHA official at any time. The U.S. military, however, is exempt from OSHA standards, with some exceptions. Executive Order 12196, Occupational Safety and Health Programs for Federal Employees, states that uniformed Armed Servicemembers, military equipment, military systems and military operations are not covered by OSHA regulations, with some exceptions (such as if equipment, operations and systems are used for activities that are not uniquely military). However, individual branches of the military may establish their own policies that enforce OSHA regulations for their particular military branch. For example, the U.S. Army began working with OSHA in 2003 through a Strategic Partnership Program to improve the health and safety standards for civilian workers at its military installations. The army and OSHA formed this partnership with the primary goal of reducing civilian worker fatalities, injuries and injuries by 3 percent annually. Through the partnership, individual army installations work with OSHA representatives to improve their workplace safety. Likewise, the U.S. Navy and U.S. Department of Defense (DoD) must meet or exceed OSHA standards, though they are exempt from OSHA regulations, according to the Hearing Conservation Program: A Briefing for Forces Afloat. The goal of the Hearing Conservation Program is to prevent hearing loss for military and civilian personnel. In order to meet OSHA regulations, navy and DoD personnel must conduct noise surveys to determine which individuals may be subjected to potentially hazardous noises, develop methods for enclosing potentially hazardous noises, provide protective hearing equipment, monitor noise levels and educate personnel who may be subjected to hazardous noises. What Does ANSI Z41-1991 Mean? Civilian employees working in military facilities are covered by OSHA regulations when they work on equipment, operations and systems that are not uniquely military. Therefore, many military facilities, operations, procedures and equipment are subject to OSHA standards in order to protect the health and safety of civilian employees. For example, Executive Order 12196 states that the U.S. Coast Guard must be compliant with the Occupational Safety and Health Act of 1970 for its civilian employees with regards to the workplace environment, operations, equipment and procedures—except when the civilian operations regard uniquely military operations, systems and equipment. OSHA is permitted to conduct unannounced inspections of military facilities, such as U.S. Coast Guard facilities, where civilian employees work on activities that are not uniquely military with equipment, operations and systems that are not uniquely military. 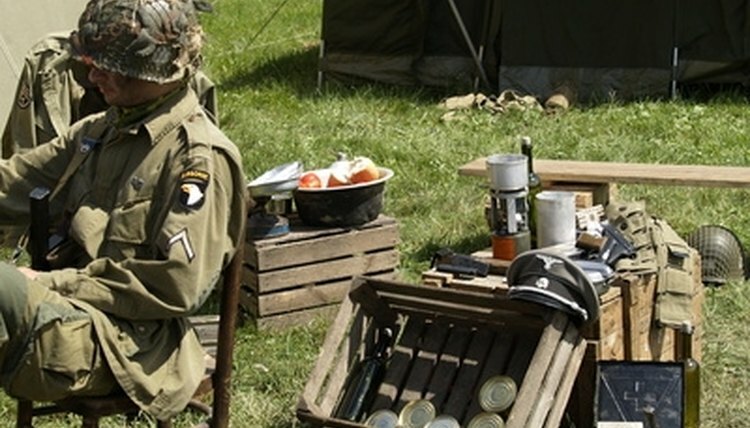 While OSHA does not cover the health and safety of uniformed military personnel working on uniquely military operations and activities, OSHA regulations are applicable when military activities and operations are not uniquely military. In general, an activity is considered to be not uniquely military when the workplace or activity is comparable to a private-sector workplace or activity, as determined by the DoD. Not uniquely military activities may include vehicle repair, construction, civil engineering, medical services and office operations. However, military operations, equipment and systems are excluded from OSHA regulations when military activities relate to the design of DoD equipment and systems that are to be used for national defense, such as military aircraft, missiles, artillery, tanks and tactical vehicles. Carrie Belt has been a professional writer since 2004, focusing primarily on business, marketing and web writing. Her articles have appeared in "Richmond Magazine," "Boomer Life Magazine" and "Richmond Times Dispatch." Belt won three first-place Collegiate Gold Circle awards for her work. She holds a Bachelor of Arts in media arts and design from James Madison University. Belt, Carrie. "OSHA Requirements for the Military." , https://legalbeagle.com/6683979-osha-requirements-military.html. Accessed 20 April 2019.